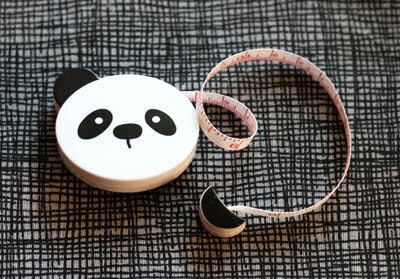 I spotted this silly measuring tape at Yozo Craft and had to get one for my mum. A tiny, goofy thank you for sewing me endless wonderful goodies. And... fine, I'll confess. I got one for myself, too. I can never resist a panda with a removable ear. look at his cute little ear. how sweet. i have little trinkets here and there that i can't part with. How did you ever decide between them all?! Love them. Oh, so we have twins? How fun! Good thing you got 'em when you did, 'cause now they're all gone. Panda was definitely the cutest! I actually have one of these in my sewing kit!!! So cute, there were other designs as well but don't remember what! They're all so cute! It would be a perfect piece for a kid's starter sewing kit! I L.O.V.E. this! My problem is, I always strip the little retractables so they no longer retract. Any tips for avoiding that?? Thank you for sharing your fabulous finds all the time! So sweet! That's so much nicer than my boring measuring tape. Need to get one too. Curses! I headed straight over to Yozo but all the pandas were gone. I managed to spend a lot of money anyways by telling myself this stuff is pure stocking stuffer gold. Thanks for the link - they're probably wondering what happened with the run on pandas! This is looks so cute and i love these designs and layout. OH, that bear is delightful! Oh my, this brings back memories. When I was very small - maybe 4 or 5 - in 1950, the elderly Oma who take care of me had a little Steiff-like dog that had a sign on it's dog-tag: Pull tongue to measure. The tongue was a retractable measuring tape. I didn't know what a ton-gee-oo was for the longest time. It was a mystery. Thank you for reminding me about this. I love fun little notions like this. Always makes me smile! oh my gosh this is precious! i love it! Adorable! 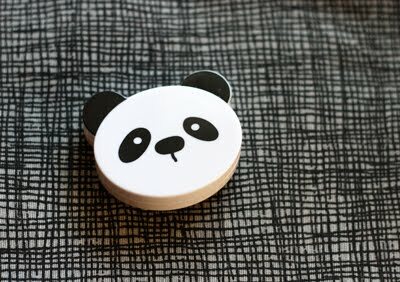 I went over to YozoCraft and I love the stuff, they have not replenished the pandas but they have a cute bear! That panda is too cute! I bought a Pinocchio (pull the nose) and a chicken (pull the egg) measuring tape a few years ago. One was to give and one to keep... I still have them both. You're smarter... next time I'll buy two that are the same! omg so cute!! thanks for the link.. I just bought the frog.. and a few other things.. fabric.. cute tape.. some little rabbit buttons.. I'm Frensh and i have got the same! oh this is adorable. i want one too... except i'll have to wait until they are back in stock. sure beats my boring, beat up measuring tape i'm using now.